In regard to the 25% tariff proposed by President Trump, I wonder how that will affect the cost of tools. If tool manufacturers start making tools again in America, how do you think the price and quality of American made tools will be? I am from the old days when American made tools were the norm. We bought tools and were satisfied with them. I wonder if tool makers start making tools here, will they be better than what now comes from overseas. There are some really fine tools made overseas with little here that can compare. It seems that we will have a lot of catching up to do if we try to revive our tool heritage. Although I would prefer to buy tools made in America, quality come first with me and I will go with whoever provides the best, whether it be America, Taiwan, China or Germany. 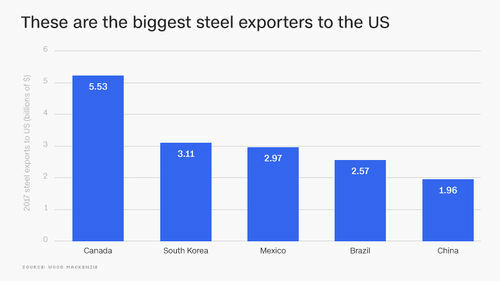 Actually the U.S. imports very little steel from China! In my opinion the steel tariff on China is a “spite” tariff for so called tech thefts! However, some of the China tariffs are really going to hit some mainstay agricultural and food U.S. products. Iowa, the top pork producing state will be hit hard by the Chinese tariff along with other agricultural products from many states. Here are the top 10 states “bringing home the bacon,” according to the latest U.S. Census data. North Carolina – $1.46 billion. Iowa is #2 in corn and soybeans right behind illinois which is #1 in both. If I remember correctly, these were both RED states. However, I sure that some manufacturers will use the tariffs as an excuse to increase prices on their products …. ! Just be thankful you still have some tool manufactures in the USA, Australia surely doesn’t!! A lot of the recently announced tariffs and proposed tariffs are more posturing than actual happenings. China has one real problem – that with 1.4 BILLION people, their own economy, (the part that is not making things for North America, Europe and places like Russia), will not stand on its own and keep the country running. They MUST keep factories that manufacture for overseas shipment, or the country will drop into a recession that some have said would be mass chaos. It might be so bad that the country could see a revolt, something that China has had too many decades of in the last century, with Mao, tribes and other terrible people. Trump knows this, and he is pushing them since he knows we actually are the main end user of the products made in China. North America, (United States and Canada) represent fully 30% of all sales on the planet, and over half of the items made in China. They just cannot afford to push back too hard or they will have starving millions on their hands if Trump pulled it all out. So China has done selective targeting of their response, and only about a total of 12 billion, minor compared to the 100 billion plus the President wants to lay on China. They did target red states, in the hope that politically they can use US politicians to change his mind, since they really cannot afford the trade war, and would die much sooner than the US would with an honest to goodness trade war. So he is pushing back with another 100 Billion since he knows China cannot win this. China just cannot afford to lose overseas manufacturing. It would be the end of China as we currently know it, and millions upon millions of Chinese would die, mostly from starvation, since they cannot even grow enough food to feed their own, less alone have a stand-alone economy. Agreed. Same way gov has implied Huawei installs spyware despite there being no evidence. But I’m not shedding any tears for China. It is a rare tool that is ” Made ” in america. Offhand I can’t think of any that are completely “AMERICAN” made. I wouldn’t worry about it. I think its a non-issue. Contrary to what POTUS says, nobody wins in a tariff war, especially the everyday consumer! My son is on dialysis, do you know how much medical paraphernalia is manufactured in China and that is one of the tariff targets. He is umemployed and he will need to fork over more for everyday medical supplies. I feel for the agricultural producers who will probably be hurt the worst! If China is targeting red states with tariffs, why aren’t they being called out for election tampering? Tennessee is right. I do, however, think Chinese prices will rise and continue to rise for a while without any tariffs. MrRon, you and I are old enough to remember we went through the same thing with Japan. In the 1960s everything made in Japan was poorly made as they were still recovering from the war. Then in the 1970s their quality improved and they really began to enter the USA, In the 1980s we began to panic that Japan was taking US jobs and their quality was becoming even better than ours! (Which was true as we in the USA really had no foreign competition after World War II and we got complacent). In the 1980s and 1990s Japan was making so much money that they began buying up American real estate by the ton, even the Empire State building! Panic ensued! Then Japan’’s workers began demanding more money and their prices rose. And over time they rose to equal the USA labor rates. Japan was no longer able to swamp the USA with cheaper and better products and all was even again. Now the same thing is happening with China . . . and I now read that Chinese workers are now demanding more money. In time it will even up. Then it will be on to India and other countries to begin the great manufacturing game. If China is targeting red states with tariffs, why aren t they being called out for election tampering? I don’t think they are targeting RED states! China import a lot of agricultural products because they have a lot of mouths to feed and it just so happens that many of the RED states are agricultural economies. Here is a list of planned import tariffs by China and the first 25 on the list are all ag products! Chinese workers will get more money and our prices will increase. In my humble opinion, when a population (Chinese people in this case) understands what free market does for their life style they will want more. In other words they want to be more US! Well I was going to buy a grizzly planer 20: with helical head 2 weeks ago and waited. Now there is a $500 tariff fee when you select to buy. so that is an approx. 25% fee added. not to get political but thanks Donald! When I read “tools” I think of hand tools, still some of those made in the US. Machinery, not so much. When it’s all said and done…who’s hands does the 500 dollars end up in?